Shed & Fence is an economical wood stain offering great coverage at up to 12m2 per litre per coat. 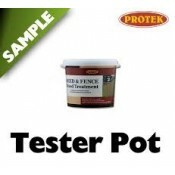 For fencing one coat will colour and weather-proof with a second coat deepening the shade. For sheds it is recommended that two coats be applied for the first treatment with only one coat needed for future maintenance. 125mm Samples of the Shed & Fence range can be purchased individually. Please note tha..